If you want to step up your game, improve your security stance, and increase your chance of surviving a violent encounter, you owe it to yourself and your family to educate yourself. Reading this book would make a great start. This book also served to launch a travelling road-show called Street Survival, which sought to correct a lot of the common mistakes that officers had made in the field. 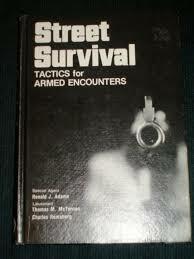 To that end, the Street Survial series of books served for many years as required reading in many academies. I was lucky enough about 6 years ago to come across more than one reference to these ‘lost books while doing my own research to keep myself safe. These books contain a lot of great information. In these books you will find much of what we study and take for granted today. The adage, “Study the Old, to Understand The New” applies here. We didn’t invent this stuff. Much of what we train today, is not new, or original as you may be lead to believe. Exploring older books can lead you to some ‘new’ discoveries – tactics, techniques, philosophies, principles. This book is 36 years old, and yet there is a ton of relevant information in it that still applies and holds up today. The combination for survivability in the street is a combination of your abilities and what you have been taught. That is NOT a one-way street. You will be provided with only so much based on budgetary restrictions, the rest is on you. Too many professionals rely strictly on what they will be provided by their employer. In our world, that’s you. You may need to justify what you think is a reasonable amount of funding to keep yourself and your clan safe, but don’t sell that short. Here’s an example: I work five days a week trying to keep myself safe, my company safe, and our clientele safe. I spend annually between $1k-$2k to achieve that goal. That money is mostly for training. That training consists of books, videos, seminars primarily. This fits my needs, but does not maximize them necessarily. This will hold true for all of us. BUT, I am making the effort to keep my education moving forward, and ever-expanding, and honing in on specific skill-sets that I require due to environmental needs. That leaves holes in my plan that you could drive a semi through, but that’s life. You can’t possibly plan for everything, but if you can narrow down your specific threats, you can assure that you will prevail under those sets of circumstances, and MAY be prepared for others based on your learning. Just because it hasn’t happened doesn’t mean it won’t or that it won’t happen to you. Complacency affects all of us in some way. Don’t let it settle in. Don’t tell yourself a story that just because statistics say it’s likely to never happen that it wont or that you aren’t the one it will happen to. Take a reality check and let that sink in. You, and only you are responsible for yourself. Be prepared. Again, that falls into several categories, but in my opinion being prepared mentally is at the top of that list. This covers awareness, but it also cover physical and emotional realms as well. Don’t be that guy/gal. You don’t get to decide that the BG (Bad Guy) is going to do, UNLESS you can. Violence is a very broad set of rules and you don’t get to know which ones are in effect, nor which ones will be on the table when the SHTF. Know that you dont know, and be good with that. Make peace with that and move forward with your plan to shut it down. What you think about violence isn’t necessarily the reality of what it will be – for you. Many things happend during ‘an event’ that you haven’t even begun to consider. Add to that mixture the fact that you haven’t practiced much of what you know nearly enough to handle this situation. Throw in your reactions – chemical dump, emotional upheaval, environmental booby-traps, multiple goals, etc… it gets complicated in the blink of an eye, and a lot goes through your head or it doesn’t. Have you prepared yourself for any of that? Educate yourself not just in Martial Arts, but in Military Martial Arts, and Police Marital Arts. Learn about the OODA loop, about the Awareness Color Code. OODA alone will make you more capable IF you have digested it, and keep it in the forefront of your mind. Under the stress of combat, and that’s what fighting encompasses, you will ‘revert without thinking to the habits you have learned in training.’ Agreed, and one important thing to consider here – if it ain’t working, move on. Don’t be the guy that continues to repeat the same ‘move’ and expects different results. Learn about spatial relationships – proximity. Test your variables, test your ability to work within certain distances and environmental constrictions. Rory Miller is a proponent of ‘In Fighting’ – I’d only heard that once before in my years of training, and it didn’t make sense the first time, until I explored the larger possibilities behind that simple phrase. Explore. Don’t hesitate to act based on what you think. Your gut feeling may be the only thing that saves you. For the uninitiated, read Gavin de Becker’s THE GIFT. Never let your guard down. Even if you’ve overcome one or many opponents/threats, don’t become blase about your abilities to overcome. Always be vigilant. There is always someone that will surprise you and possibility defeat you. Be realistic, not complacent. ‘Let the circumstances dictate the tactics, not vice versa.’ True Dat! Always be rehearsing mentally. It’s as important if not more-so than hitting the gym or the Dojo, in my opinion. As an example, I have personally watched a video on a specific technique, that I only mentally rehearsed before having to actually deploy it, on more than one occasion. In Japanese culture, I believe that that is referred to as Mushin – without mind. It works, and don’t let anyone persuade you otherwise. Your mind is your best tool – develop it. Survival instinct is string, and your mind WILL take over when all else fails. “Repetition of good tactics forms good tactical habits.’ Amen, right? “you must be ready to execute it without hesitation.” In the context of use of force – you must commit fully once you have decided to act. Totally agree. I have done otherwise, and gotten what should have been expected results. If you don’t fully commit, then you are holding back. If you hold back, you lose advantage. If you lose advantage, you also lose surprise. Its a crap shoot after that. Good luck, you’ll need it! I’ll explore Volume 2: The Tactical Edge in a future article! Next Next post: Hide in Plain Site – Tammy Yard-McCracken, Psy.D.